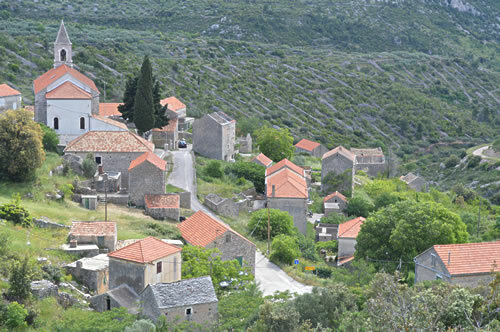 The trip up to Velo Grablje from Stari Grad provides you with marvellous views as the road winds its way uphill. 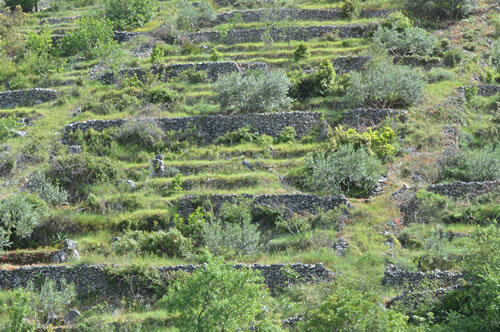 The slopes are covered in a distinctive lattice of drystone walls and mounds. As you reach the top, the view to the south opens up, with Vis floating in the distance. 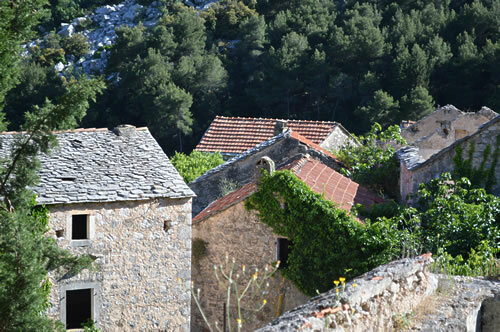 And just off the road, enjoying that gorgeous view in the sunshine, is the rather picturesque village of Velo Grablje. Grablje is named after the hornbeam bush (‘grab‘) that grows on these uplands. Most likely the village started life as a shepherd’s settlement, a place for seasonal grazing of the animals. And there’s fresh water here too, very important for people and their animals! Although we now call this village Velo Grablje, which we might translate as “Greater Grablje”, it used to be known as Gornje Grablje, meaning “Upper Grablje”. This is, in fact, a village in two parts. Down a small track lies Malo Grablje, which in English would be “Lesser Grablje”, or “Lower Grablje”. Up in Velo Grablje, there’s work going on and sounds of activity. It’s May and time to repair the damage of the past winter. It all looks quite peaceful, though, as we take a wander around. Numbered houses – a new feature of island life! I’m interested to see that the new house numbers don’t go in streets, but have a single sequence right through the village. That appears to be the way for smaller communities. I hope the numbering plan is obvious to the postman! 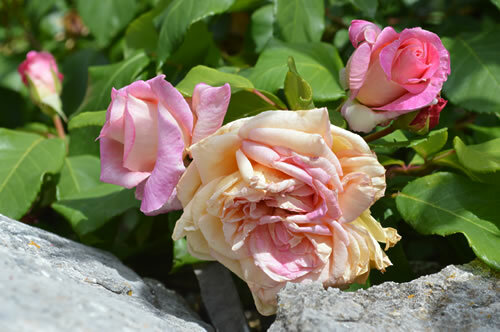 And everywhere there are roses in bloom – what a lovely splash of colour against the stone walls! 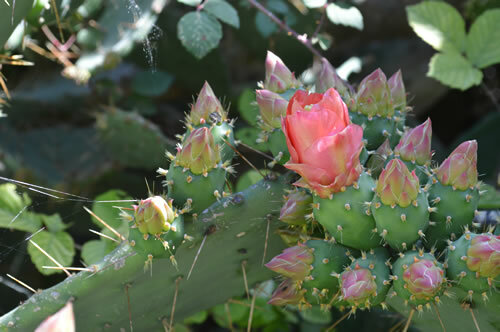 I wonder if they make rose liqueur from these? 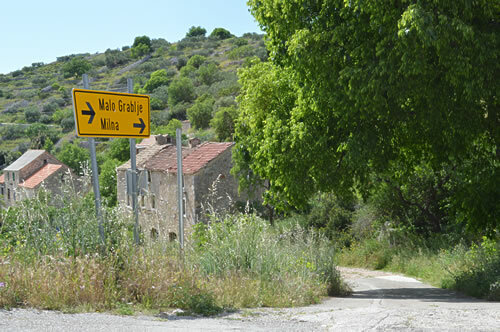 After a walkabout in Velo Grablje, we take the small road downhill, following the signpost to Malo Grablje and Milna. This way for Malo Grablje and Milna! We find ourselves entering a steep-sided valley, still with terraced fields clinging to the slopes. Some appear to be still tended – or is it maybe revived? 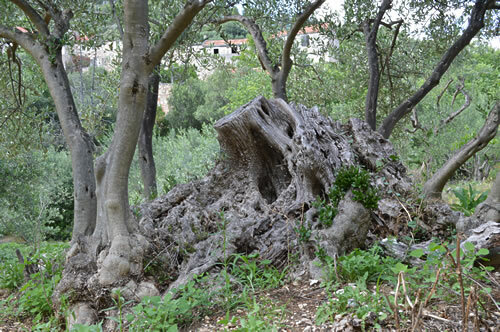 There are what look to be young olive trees on some of the steps. 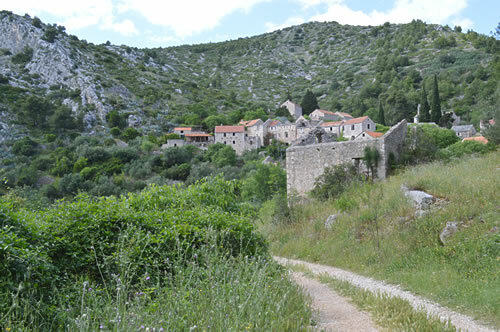 The village of Malo Grablje comes into sight around the corner, perched above us at the top end of the valley. 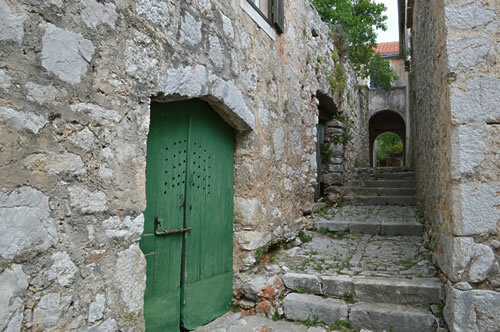 This is the lower part of Grablje, with only a small clutch of houses in this hidden location. Nobody lives here now. It’s completely empty since the villagers decided in the 1950s and 60s to move lock, stock and barrel down to the pretty little cove of Milna, a couple of kilometres away. They didn’t sell their property here, they simply built themselves new houses in Milna. 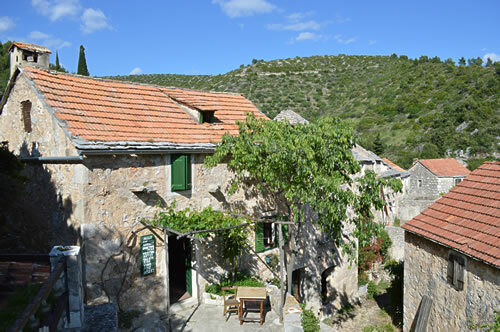 The old stone houses of Malo Grablje are gradually returning to nature. The roofs are falling in, so you can see daylight through the windows. 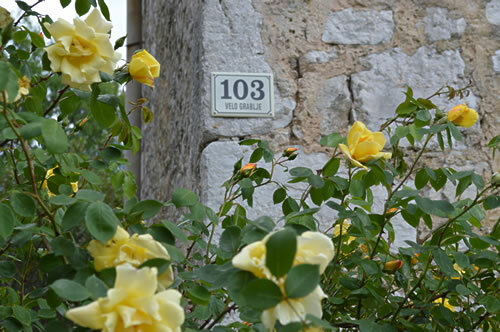 Trees grow inside the walls, the cobbled pathways are overgrown, and in contast to Velo Grablje’s cultivated roses, the flowers here are wild. As we walk up to the village, there’s a sign on a wall ” Konoba -> “. It seems sad that the lively centre of village life must also be long gone. But we follow the direction of the arrow as, to be honest, there aren’t that many choices. Up a flight of steps, under an arch, it’s all fading and rather beautiful. Must have been a harsh existence here, though, when you depended on growing enough each year to sell, so you could buy flour to feed your family. 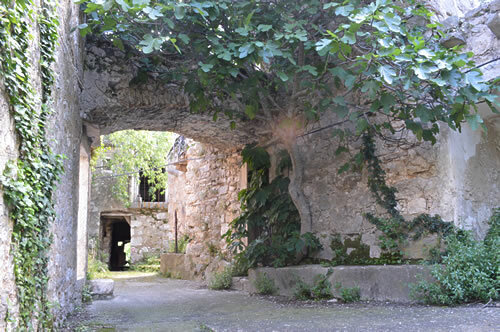 The path leads us through a cellar and past a large old olive press that looks like it could still work. 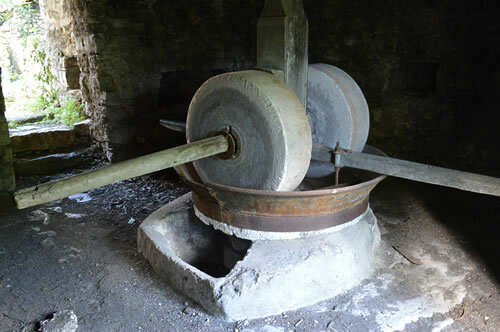 Does anyone still use the old stone wheels such as this? You’d need four people to push it round, or would you use a donkey? Out from the dark of the cellar, the path turns uphill again, and the konoba comes into sight. 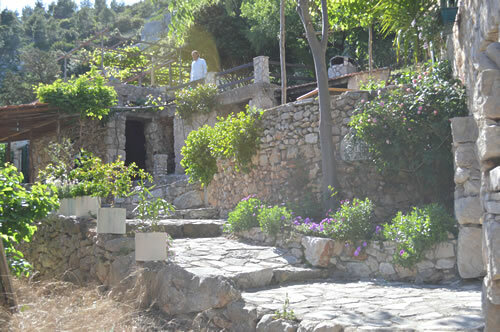 Brightly coloured flowers line the steps, a menu hangs next to the open door… and is that a chef standing there? Well, yes it is! This is the Stori Komin, the “Old Hearth”, and it’s very much open for business!! Stori Komin open for business! The konoba is run by Berti Tudor, and he’s very happy to see visitors. Not so many come in May, and usually only in the evenings. Would we like a glass of wine? We certainly would, how nice! In the summer it gets busy, as this is quite a popular place to come for dinner. And what a great place to eat. 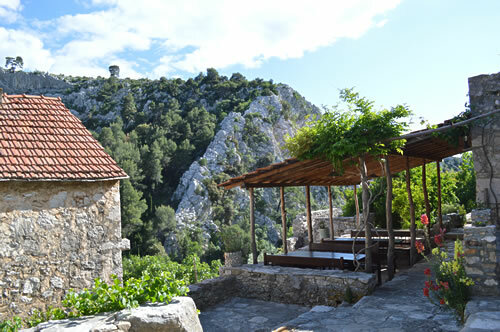 The upper terrace has a spectacular view over the rooftops to the rocky heights of the canyon wall opposite. 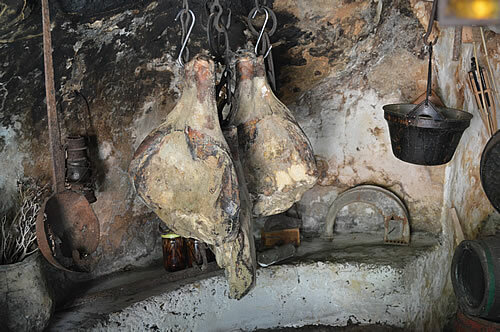 Inside is the old hearth itself, with a couple of hams hanging up to dry. 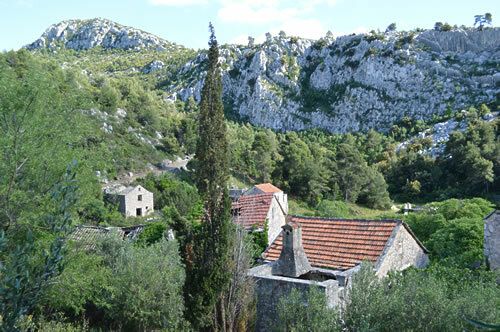 The history of this place is fascinating, a tale of peasants who for centuries worked the land for a tithe to their noble owners in Hvar. At times they did well, most notably when wine production on the island was at its peak in the late 1800s as phyloxera began to spread across Europe. It didn’t reach the vineyards of Malo Grablje until 1915, so it was a prosperous time. The village built an impressive library, school and water cistern, and in 1905 bought land on the coast, with each household receiving a parcel. 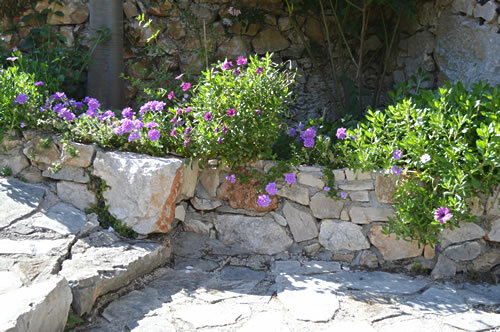 After the First World War, replanting the marginal terraced vineyards with new root stock wasn’t an option, so rosemary and then lavender oils took over from wine as the main crop, along with buhač (pyrethrum). 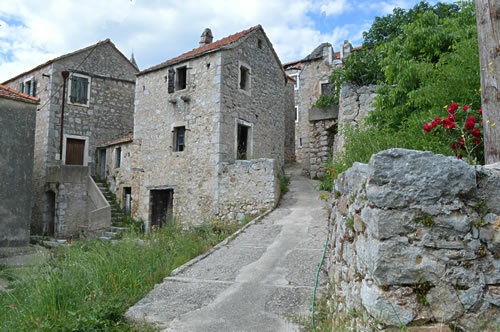 That was a very important market in the days before DDT arrived on the scene in the 1930s, and it’s said that many houses on Hvar gained a second story because of buhač. Of course, between the more prosperous times, life must have been pretty hard. There were no roads in and out of this place, only donkey tracks. 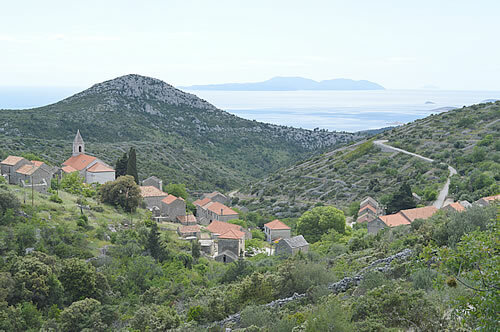 It wasn’t until late in the 20th century that the south shore road was constructed, linking the village with Hvar town. Even the present track between Velo and Malo Grablje is surprisingly recent, presumably they all walked it before. 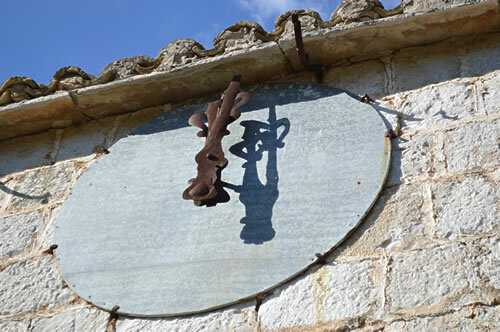 Given all that, I had assumed that the concerted move of the Malo Grabljeni to Milna was because they simply couldn’t make a living in the old village. But apparently not so! 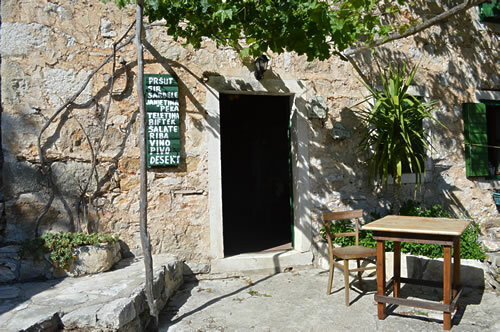 They moved to Milna because they could afford to, because they had building plots there, and because by then they actually owned many of the fields in the fertile stretch between Hvar and Milna. They moved because they were doing well. Lavender was fetching a pretty good price in the 1950s! 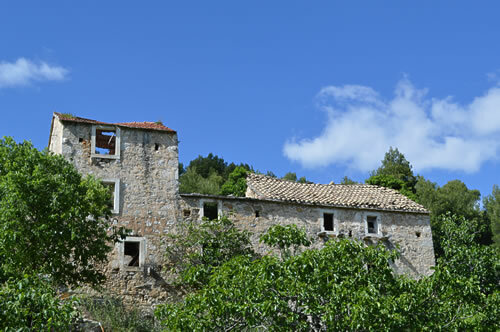 Personally, I find the old stone houses of Malo Grablje much more attractive than the modern buildings in Milna. Crumbling these may be, but they have such character and an affinity to the landscape. After nearly 60 years of being abandoned, roofs are caving in, and nature is returning. It’s a delightful place to wander around, very peaceful and you can really get a sense for a way of life gone by. I wonder if any of the next generation of villagers will ever be tempted to move back in here? If so, a serious amount of renovation would be called for! What a truly inspiring place for sketching and painting. I’m looking forward to a return visit later in the summer! Dinko Tudor’s book on the history of Malo Grablje and Milna (in Croatian only, I’m afraid) can be bought at the Stori Komin.